Dehydration can affect every skin type and age, especially those with dry skin. Skin dehydration is the loss of water in the skin and occurs when the skin loses more moisture than it takes in. Dehydration often leads to thinning of the skin, promotes development of fine lines, wrinkles, crow’s feet. Being dehydrated can change the appearance of your skin, it may appear flushed, dry and older looking. The skin dehydration often result from a dry climate, not drinking enough water, prolonged exposure to sun, poor skin hygiene, air conditioning, harsh soaps etc. Your skin naturally loses up to half a pint of water every day, which means it constantly needs replenishing. It’s essential to seal moisture directly intp your skin to keep it healthy and well-hydrated. What you should do if your skin is dehydrated? 1. Apply DR’s Secret Moisturizer every night to trap moisture in the skin. 2. Use a hydrating Facial Mask (Q10 Gold Mask) once a week. 4. Start on DR’s Secret T Series Program to replenish the skin with vitamins and minerals. Day	1, T2, 5	Optional use of Skinrecon T4 (after Toner T2). Night	1, T2, T3 + T4, 6 (Moisturiser)	Mix 2 to 3 drops of Skinlight T3 to an equal amount of Skinrecon T4. Around 3 months on a daily application usage. Use Q10 Gold Mask to hydrate your skin on a weekly basis. I have always enjoyed outdoor activites such as tennis and swimming which brought about skin problems such as dryness and pigmentation. "Despite ending all outdoor activities, my skin problems persisted. It was till my friend introduced me to DR Secret products, did my skin see an improvement. I was thrilled with the results after a month. My skin became healthier, radiant and clearer. Now I continue my outdoor sports because I'm confident that DR Secret can protect me from the harsh effects of the environment and pollution." For dry, peeling, damaged, sun burnt, flaking or dehydrated skin to promote healing and hydration. Especially in winter, summer or dry climate. DR’s Secret Range is manufactured in the United States. 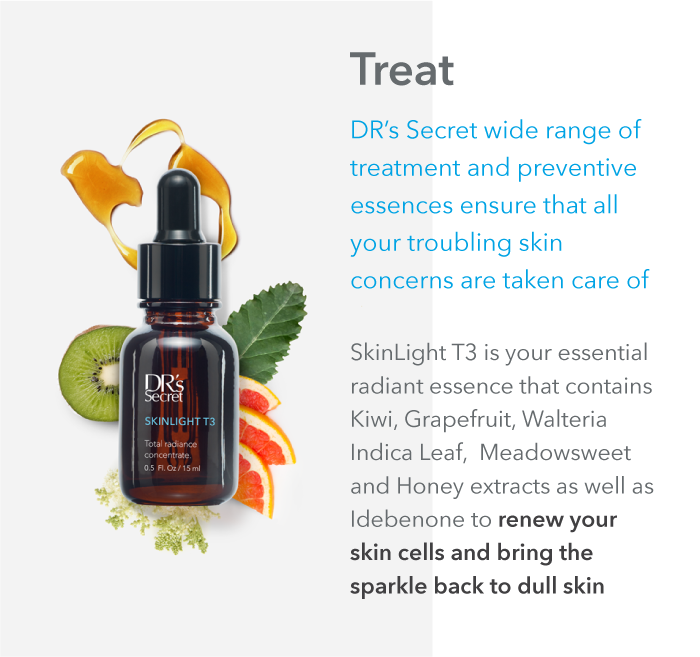 DR’s Secret means Dermatology Revolution, it uses revolutionary techniques in its unique blend of natural ingredients. We use the latest dermatological advancements from around the world to bring you the best range of products for your skin care needs. "I particularly prefer No.6 Moisturizer as people like to stay in air-conditioned rooms, especially during summer. That's why Moisturizer is important for me to maintain my healthy and glowing skin."